Chiller update after opening day! Robin's train was on the track yesterday. According to TRs I read from yesterday Robin was testing. Don't forget this is in New Jersey -- one of the strictest states when it comes to testing/approval of amusement rides. Well I'll be damned my apologies guys! There definatly is a Robin train in the boneyard near Nitro but I can't believe they really switched the fiberglass coating on these trains. Hopefully it opens soon. You can tell that's batman's train because the circles on the side are silver and not black. 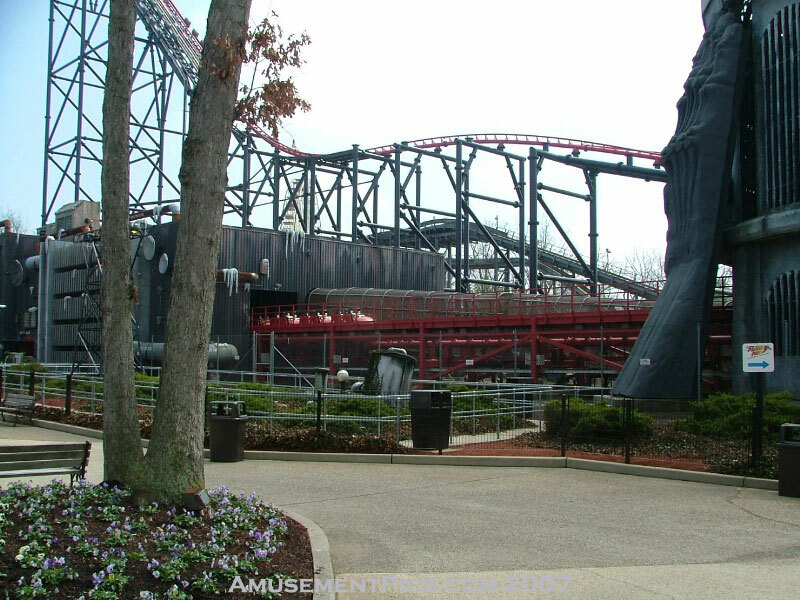 Perhaps the new track configuration was in SOME way related to the SFNE Supes incident? Think about it this way...a patron comes up the exit ramp, is clearly handicapped in some fashion, and wants to ride. The ride ops (Lord love 'em, they've got an impossible job) have to make a snap judgement on whether this person can ride *safely*. Keep in mind there's always the threat of an ADA lawsuit if the person gets turned away from riding. The barrel rolls did REQUIRE a certain amount of *trunk control* on the part of the rider to remain reasonably vertically-oriented (also keep in mind the critical Z-position necessary to ride safely). Even for those of us able to maintain our seat/body position effectively, the ride provided an insane out-of-control feeling. Just forced to wonder if that OOC *feeling* might not have THEORETICALLY become an OOC *situation* - where the rider was unable to remain safely in the seat. I guess what I'm getting at is this: Although we loved the ride (myself especially), I can see where there were concerns OTHER than valleying that might have been taken into account before deciding to remove those (unbelievable!) inversions. I'm thankful to have gotten to ride with the "lappies" and the rolls...but I guess I can see where other factors came into the decision-making.